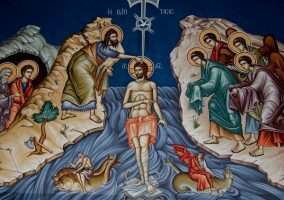 On January 19, the Russian Orthodox Church celebrates Theophany, one of the great feasts of the Lord. A problem associated with sacramental thought, if this principle is forgotten, is that things that are blessed somehow cease to be what they are. Instead, they become exceptional moments in which the things of this world are no longer things of this world. They change while everything around them remains the same. We go to Church, the miracle happens, but remains confined to the altar or the font, while the world around it remains unchanged. The Church becomes the locus of the extraordinary while the world is stuck in the ordinary. It is, ironically, a two-storey sacramental order. This thing is holy, that thing is not. It is a diminishment of Christ’s work. The sacraments become points of contact with the second-storey, tiny windows in which miniscule rays of sunshine peak out into an otherwise darkened world. But the world itself remains dark.